If you receive a rent payment in cash, you should provide a receipt. If you are a landlord, or if you are a tenant and want your landlord to give you a receipt, our Rent Receipt Template can come in handy. You can also use the PDF rent receipt form to print out a batch of blank receipts. Note: If you are using an invoice template to bill your tenants, you may not need to use a different receipt template. You could just stamp or write "Paid" in big letters on a copy of the invoice. See our simple receipt template as an example. This is a blank rent receipt form (3 receipts to a page) with editable fields. Print as a blank receipt, or fill in the information you want to have printed. The landlord should sign in the "Received by" spot to authenticate the receipt. 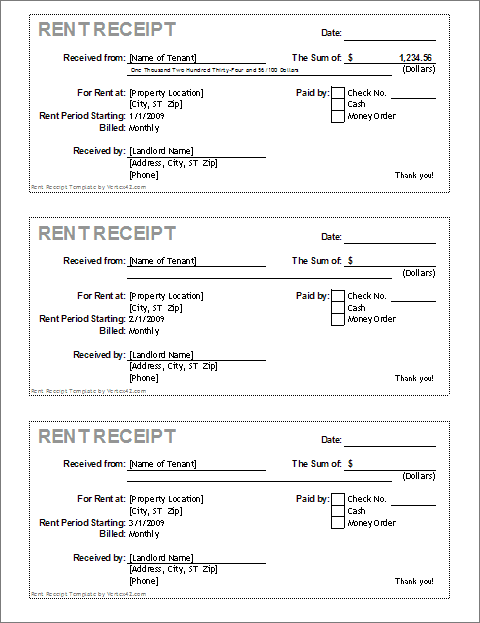 This printable rent receipt form is a PDF file, so you'll need Adobe Reader to view and print it. You can also edit this PDF. It will automatically update the two other receipts on the page after you complete the top one. You can either fill out the entire receipt for a single transaction (with duplicate copies for you and the tenant) or you can fill in the "Received by" info and print a bunch of blank receipts with your specific contact information. This Rent Receipt Template lets you print receipts for payments made by cash, check, or money order. The information can either be pre-populated, or you can print a bunch of blank receipts. The receipt template contains two separate worksheets for listing the rental payment period in two different ways. In the first worksheet, you enter the rental period as a begin date and end date. In the second, you specify the billing period (monthly, bi-weekly, etc.) and choose the starting date. This template includes a formula derived by Vertex42.com that automatically converts the numeric amount to words. For landlords ... try our new Rental Application Template. Tracking Receipts and Payments - One of the benefits of using a spreadsheet to create and print your rent receipts is that you can save a copy of the file as an electronic record. It's as simple as creating a directory on your computer called "receipts" and sub-directories for each tenant and then saving your files with the date or the receipt number in the filename. You can also maintain a separate billing statement for each renter to keep track of payments. Customize the Receipt - If you are a landlord, you may want to save a copy of the rent receipt template for each contract that you have, customized with the tenants information, payment periods, etc. You may also want to add a unique watermark to the receipt to make it difficult to copy. Are Rent Receipts Required? - You should check your local laws, but normally a check acts as a receipt (because a record of the transaction can be obtained from the bank). A landlord doesn't usually have to provide the tenant a receipt, although a renter should always request a receipt for payments by cash. A landlord may be required to give a written receipt for deposits or payments made before the tenant moves in. Print Receipts on Perforated Paper - Our 3-to-a-page receipt forms are designed for printing on Perforated 8.5" x 11" Paper (1 col x 3 rows). You can order paper from PerforatedPaper.com or some other office supply or paper supply company (Vertex42.com is not affiliated with perforatedpaper.com). Landlord Signatures - Update 2/8/2016: To help prevent tenants from creating fraudulent receipts, landlords may want to both customize their receipts (to make them difficult to duplicate) and also sign the receipts. We have added signature lines to the latest versions of the templates.